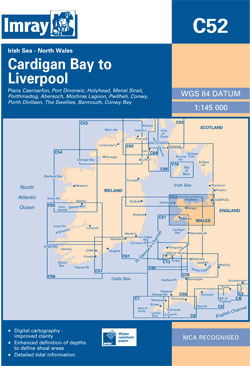 The north-west and north coasts of Wales from Tremadoc bay to Liverpool. Scale: 1 : 138,600. One-minute gridlines. Larger scale plans of Caernarfon, Port Dinorwic, Holyhead, Menai Strait, Porthmadog, Abersoch, Mochras Lagoon, Pwllheli, Conwy, Port Dinllaen, The Swellies, and Barmouth.